We’ve been on a bit of bread kick around here lately. Finding a decent substitute has been a goal of ours since we started keto. This recipe is adapted from the Red Mill webpage using one of their many low carb baking mixes. I try to stay away from anything labeled “low carb” because they’re typically infused with tons of sugar alcohols. This baking mix doesn’t however it does contain wheat gluten and a small amount of cane sugar. The net carbs per slice are around 5 net carbs so this is a bread that should be eaten sparingly. The bread is very dense like a whole grain loaf of bread and it retains some moisture. Even so it does toast in the toaster. It’s almost sweet to the taste buds and makes a very good breakfast type bread. The net carbs on this recipe are dependent on how thick you slice the bread. When slicing the bread into 20 slices the net carbs works out to 5.1g net carbs per slice. These slices are about 3/4 the thickness of regular sliced white bread. You could attempt to slice the bread into more slices which would lower the carb count per slice even further but this might be difficult to do and require a very sharp bread knife . Preheat your oven to 350 degrees Fahrenheit. In a large dry mixing bowl mix the low carb baking mix, baking powder, nutmeg and sweetener together until well blended. Make a well in the center of the dry mixture and add the oil, water, eggs and vanilla to it. Mix well with a fork or whisk until all the ingredients are blended. This should only take a minute or two. 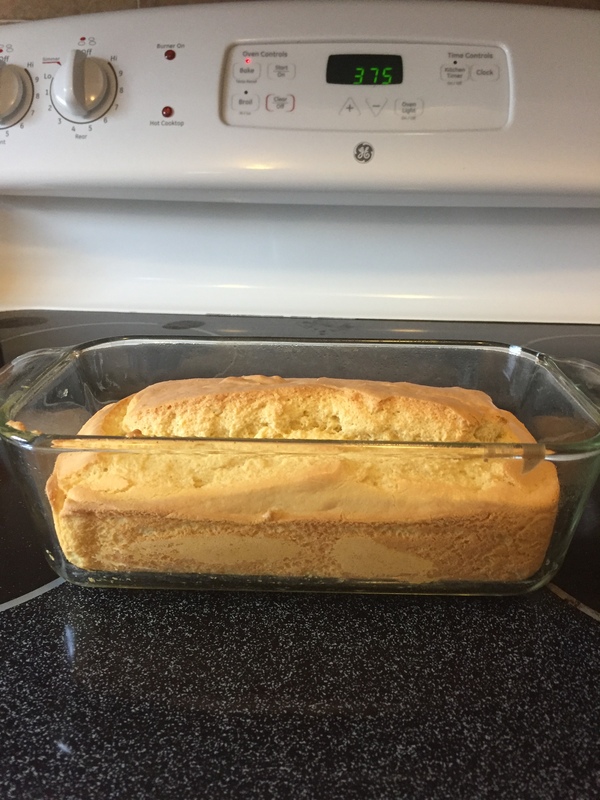 Spray an 8×4 loaf pan with non stick cooking spray. Add the bread batter to the pan and spread it out evenly. Bake at 350 degrees for 50-60 minutes. Check the center with a toothpick to insure it is done. The toothpick should come out clean when it is cooked throughout. Adapted from Bob’s Red Mill. One of the biggest struggles in the Keto lifestyle is adjusting to a life without bread. Sandwiches? Toast? Hamburgers with buns? All a thing of the past. Or are they? 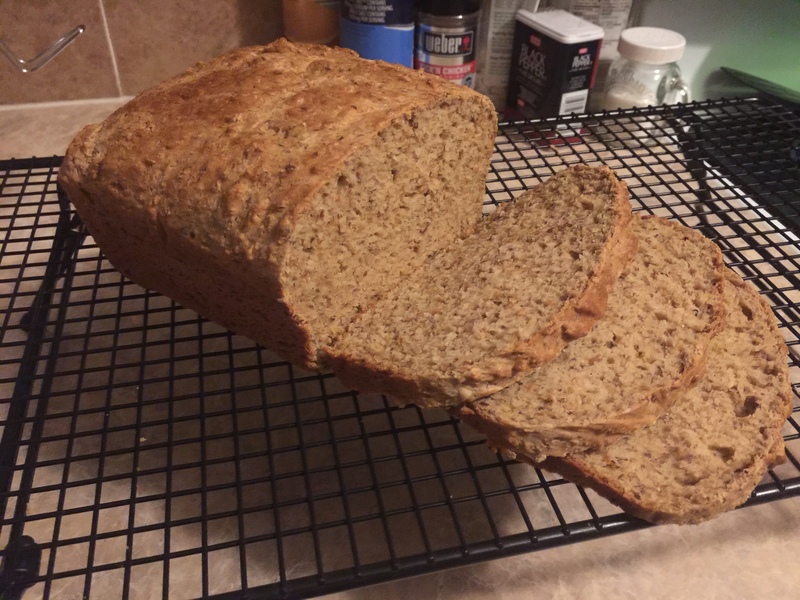 Recently I came across a recipe for a low carb ketogenic friendly bread that really takes a bite out of those cravings! While this bread isn’t difficult to make it does take special attention so some finer details to make it “fluffy” enough to match that feel that only bread provides. 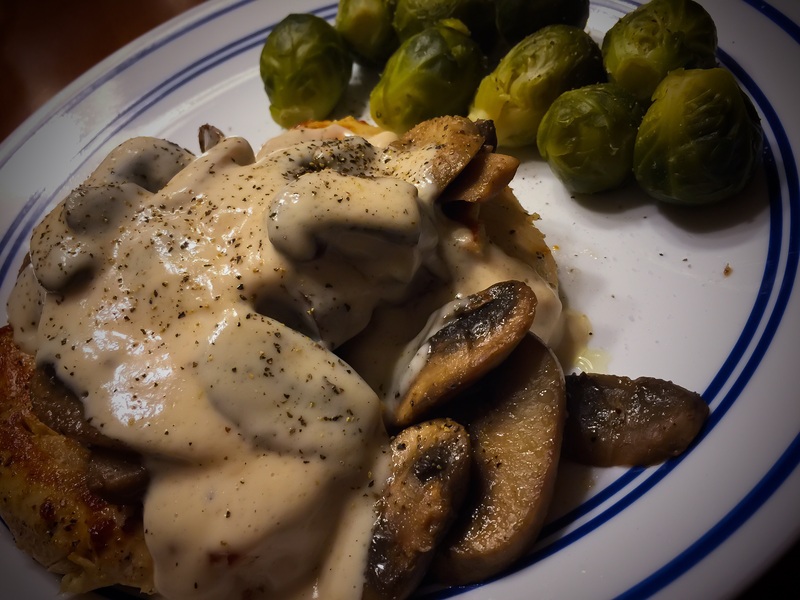 This recipe is adapted from ketoconnect.net. Preheat your oven to 375 degrees Fahrenheit. While the oven is preheating separate the eggs splitting the whites and yolks into different bowls. Add the cream of tartar to the egg whites and beat the eggs with a hand mixer (KitchenAid 7-Speed Digital Hand Mixer) until peaks are formed. Whipping air into the egg whites at this stage are what gives the bread that fluffy texture. If you want denser bread go easy on this step or not at all. 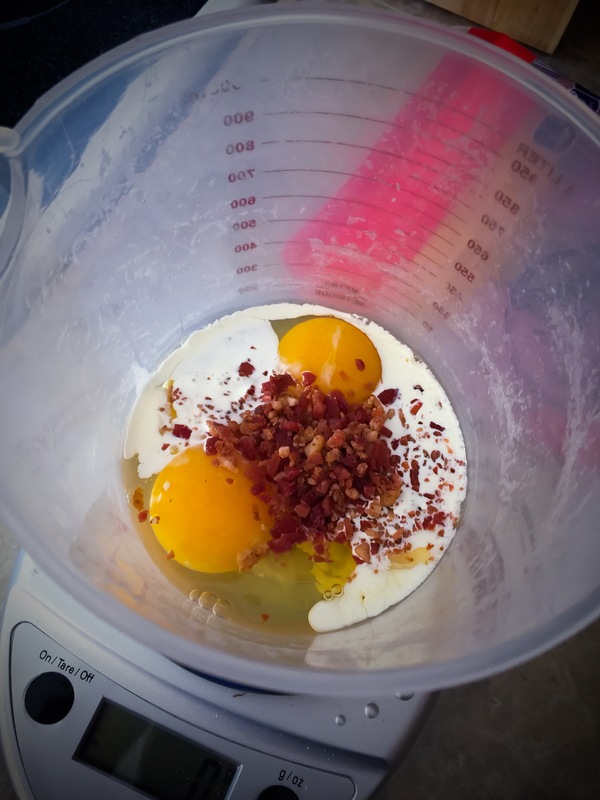 Mix the egg yolks, butter, almond flour, baking powder and salt in a food processor (Hamilton Beach 12-Cup Food Processor) until all the ingredients are combined well. Some lumps won’t matter but it’s best to try and get them all out at this stage. Add 1/3 of the egg whites to the mixture and continue to process it until it is well mixed. Critical point! Add the remainder of of the egg whites to the processor and mix it in. Do this only long enough to mix it and no longer. This will insure the air isn’t worked out of the egg whites entirely and add the fluff we’re looking to create! Finally pour the mixture into a buttered 8×4 loaf pan (Calphalon Bakeware Loaf Pan) and bake at 375 for 30 minutes. Check the bread by piecing it in the middle with a toothpick. If the tooth pick comes out clean it’s done. If there is some dough stuck to it then it needs more time. Here is a helpful video if you’re struggling with getting those egg whites fluffy! Living in near Pittsburgh Pa we have strong ties to the Polish heritage that runs so strong here. What ties a group of people together better than their food? This recipe reminds me of the haluski (Fried cabbage and noodles) that is so often present at family gatherings. Cabbage is a great low carb food and this dish is a great side kielbasa or just about any other meat. We used our handy dandy T-fal Wok again for this recipe but you can use any large pan. Cook your bacon over medium heat. Once the fat begins to cook down and there is grease in the pan add your onions. When the bacon begins to look crisp add the cabbage, salt, pepper, worcestershire sauce and butter. Stir the mixture occasionally until the cabbage softens. 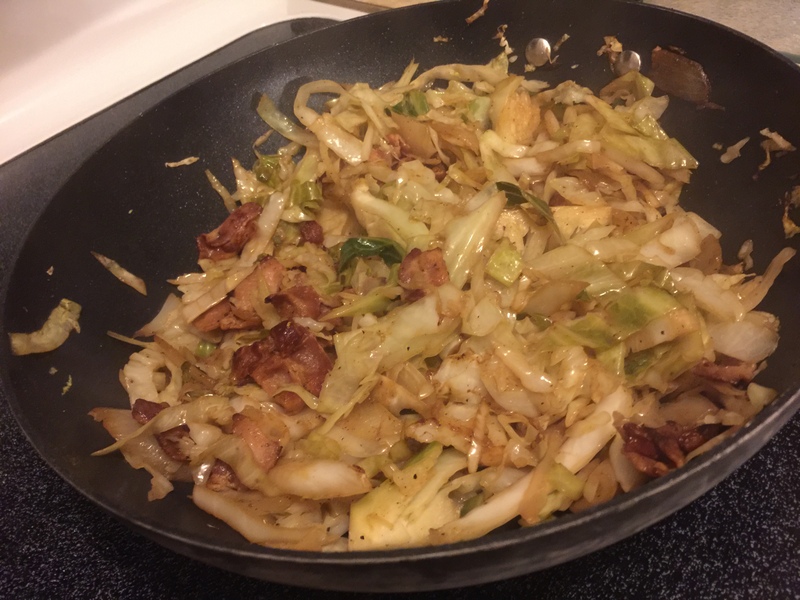 I allowed the some of the cabbage to brown slightly which I think adds some complexity to the flavor. I end up adding more salt or pepper once it’s served but that’s entirely up to you! Enjoy! Breakfast foods can get stale after awhile. We can go through a carton of eggs here in about half a week. Fried eggs, boiled eggs, scrambled eggs etc. Everyone once in awhile it’s nice to change it up a big and have a nice big fluffy omelet! 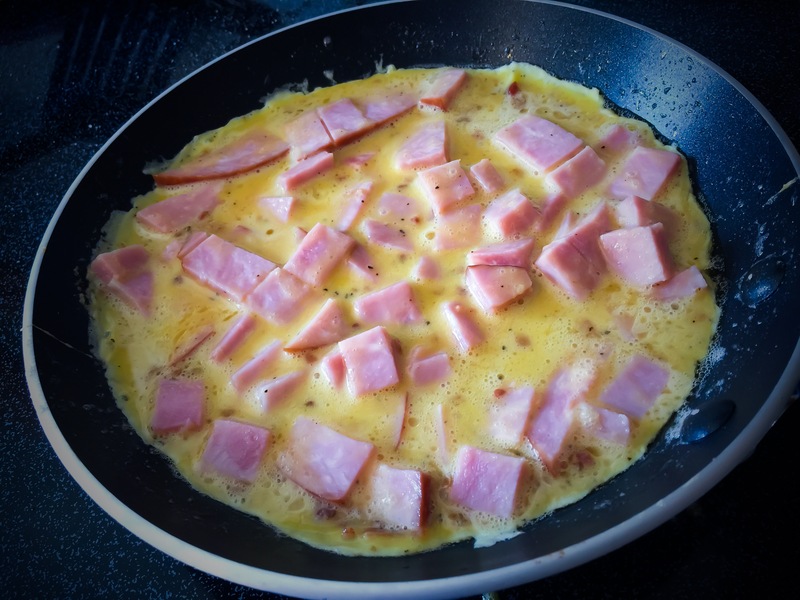 Today I made a great tasting and simple omelet that tastes wonderful! The secret to a good omelet? Lots of air! (And a nice whisk !) Listen up baby birds cos’ I’m going to show you. Melt 1 tablespoon butter in a small skillet over medium low heat. When cooking omelets you don’t want to scorch your eggs before they’re cooked all the way! The top of your eggs should start drying out but the bottom will burn before it’s cooked all the way through. At this point I usually take two spatulas and flip my omelet over to cook the top part. (It takes some skill and practice. You’ll probably make a few messes before you get the hang of it!) Leave it turned over for 30 seconds or so and then flip it back over. Take your cheese and place it on half the omelet then fold the other half over and leave on the skillet for another 30 seconds to melt the cheese. 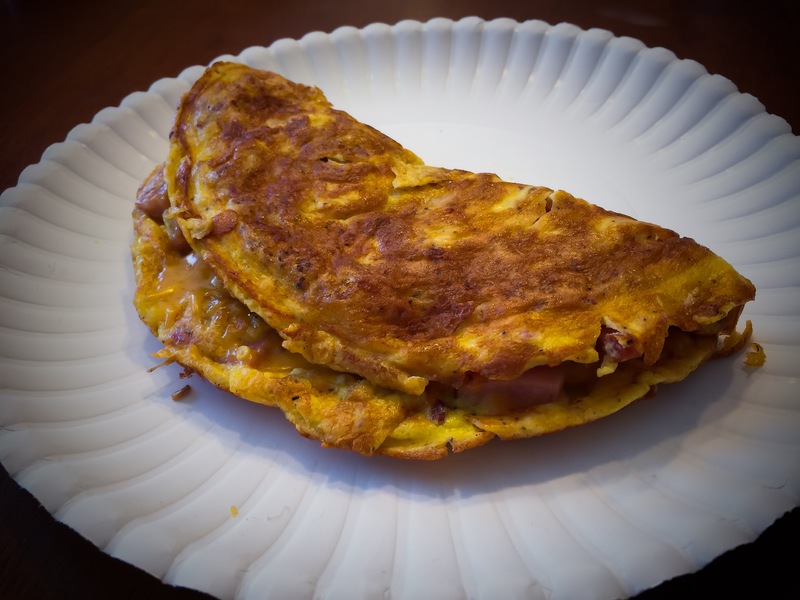 If you’ve done everything right you should have a great tasting omelet on your plate! Enjoy! Ok, I’ll be honest here. Typically we make our own Alfredo sauce here but in this recipe we used a prepackaged alfredo from Aldi’s. (It’s called Priano Alfredo) It’s cheap, has 4 grams of carbs per serving and it’s tasty! In the future I’ll add our favorite homemade sauce but until then here is our favorite chicken alfredo. Go ahead and grab a medium skillet and melt your butter over medium high heat. Once your butter is melted add your chicken breasts. Salt and pepper to taste. While that’s cooking grab a small sauté pan and melt another tbsp and then add your mushrooms. Once your chicken has cooked through and your mushrooms are sautéed until tender split your chicken onto two plates. Add half the mushrooms to the top of each serving of chicken. Cook the alfredo sauce until hot either in the microwave or another small pan. Pour one serving of sauce onto your chicken and mushrooms. It’s simple, fast and delicious! Serve with a side of your favorite Keto vegetables. We chose brussel sprouts but buttered broccoli is also a good choice! Enjoy! Ok folks I have to apologize in advance. Since I started this blog my goal has been to post a recipe a day so that the people following along could have a simple guide to meal planning. Well today has been hectic with activities and I haven’t had any time to cook anything! (For your reference .) This is something I made a few days ago and I put it on the back shelf because it was similar to another recipe I had posted. The difference here is the prep time. No time to cook up steak for a salad? Well the answer to your problems is here… Steak Ums! Yes I know this isn’t exactly rocket science but it’s a fast meat to cook when you’re in a pinch and you want a hot salad topping. I made this salad Greek-ish and you can too. What I like about cooking steak ums is you can throw them in a skillet (I’m in love with T Fal and their thermo spot professional cookware. It’s relatively inexpensive and everything is evenly cooked! T-fal Professional Thermo-Spot Fry Pan ) with 1 tbsp of butter over medium high heat and they’re cooked in about 5 minutes. I sometimes put a little malt vinegar on the steak as it’s cooking. It gives it a nice mellow flavor. Salt and pepper the meat to taste. 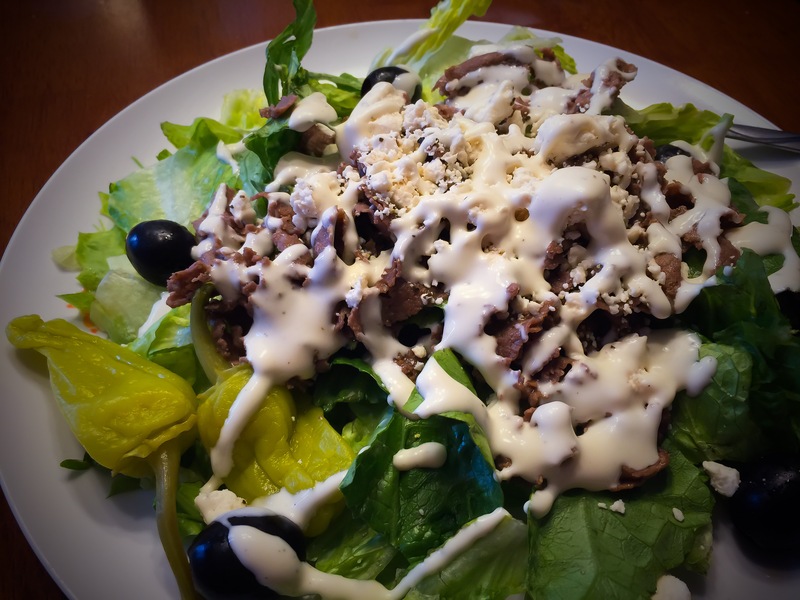 Place the meat over your lettuce, add your feta cheese, olives, dressing and pepperocini to the top and you’ve got a quick and easy steak salad. Enjoy! I seem to be on a salad kick this week. 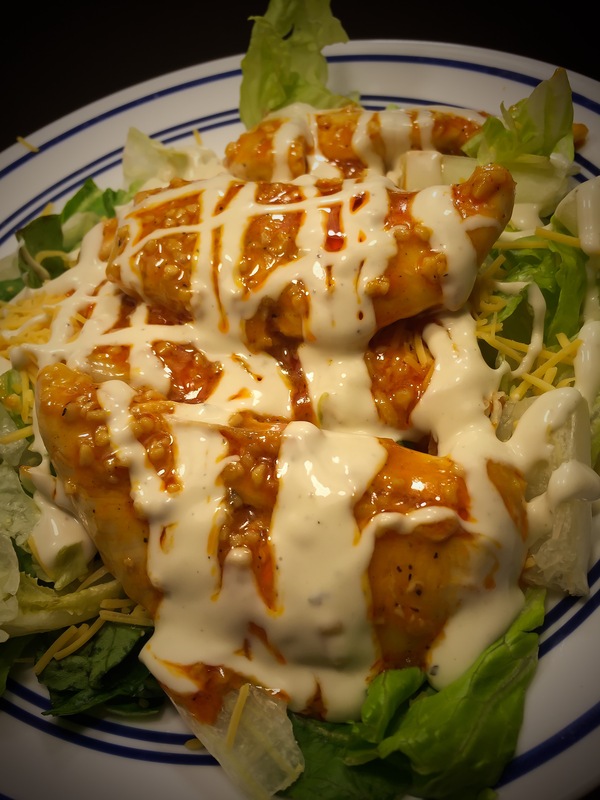 Last night for dinner we made ourselves a nice and easy buffalo chicken salad that was delicious. Not too spicy but enough kick to warm your taste buds. As with most of my cooking it’s simple and it contains minced garlic. Check it out. Take your garlic and butter and combine them in a small skillet over medium heat. Once the the butter starts to simmer you’re ready to add your chicken, salt and pepper. The secret to this recipe is cooking the chicken slowly. Dry chicken is a terrible terrible thing. (I put small slices into the meat lengthwise to aid in cooking and to also let the flavor seep into the meat as well. I don’t know if this helps but I’d like to think it does!) The recipe calls for one serving of the buffalo sauce but what I actually do is pour just enough on each piece of chicken to cover the meat entirely. While your chicken is simmering prepare your lettuce on a plate. Once the chicken is cooked through turn the heat down to low to cook off any excess water that may be left from the chicken and garlic. When that occurs place your chicken on top of your lettuce, sprinkle your cheese on top so it melts. At this point I ladle the leftover butter and buffalo sauce on the salad. Last but not least dress with ranch dressing. Enjoy!